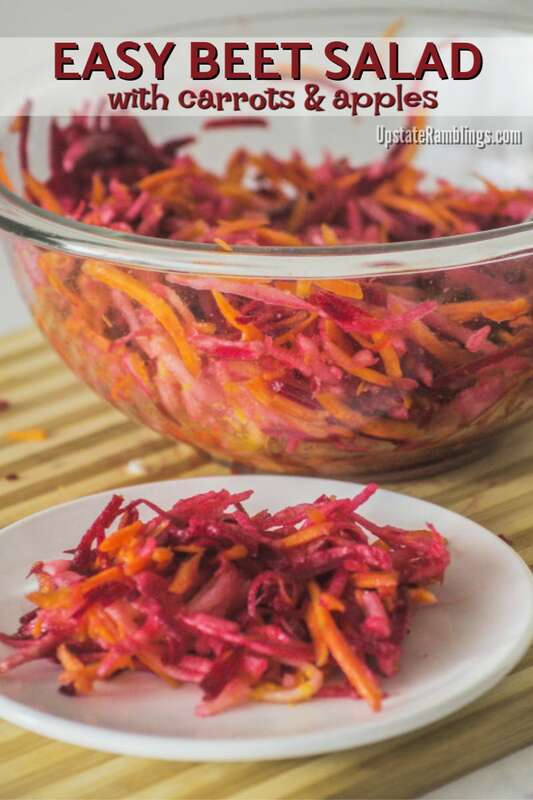 This Raw Beet Salad with apples and carrots is a tasty vegan side dish salad. The healthy recipe is simple to make and the salad is both sweet to eat and gorgeous to look at. Take this refreshing salad to your next picnic or potluck supper! This post contains affiliate links. As an Amazon Associate I earn from qualifying purchases. 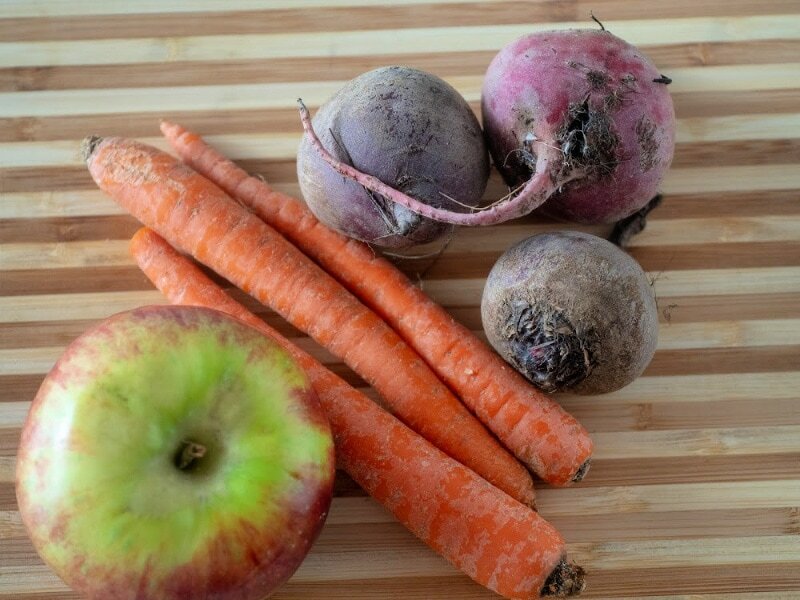 When I use beets I usually make pickled beets or roast them for using in a dish like beet gratin. But they are also delicious served raw. Raw beets are more firm and crunchy than pickled or roasted beets and they still have the sweet taste that you expect from beets. 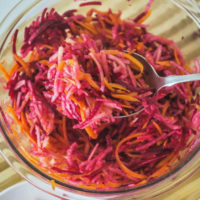 This raw beet salad is a refreshing and pretty side dish made with apples and carrots and topped with a citrus dressing. This raw beet salad is an excellent side dish to make ahead of time, because it keeps well in the refrigerator. To keep it looking pretty and make it easy to transport I layered the ingredients in a quart mason jar, and then poured the dressing over the top. 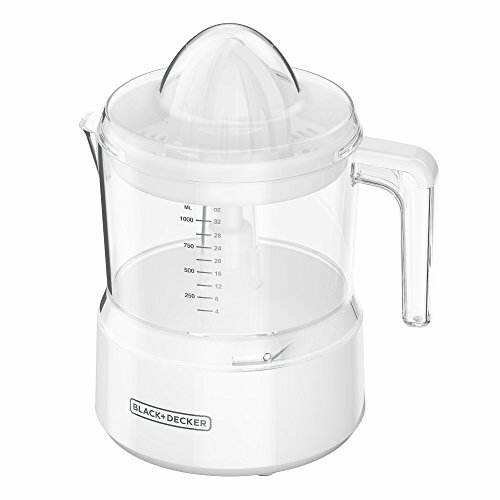 When it is time to serve the salad can be poured into a bowl and stirred. How do you prepare raw beets? Raw beets are very easy to prepare. After they are washed you cut the ends off and peel the thin layer of skin that covers the beets. 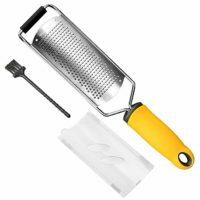 I usually use a paring knife, but a vegetable peeler works too. Then use a food processor or spiralizer to grate them into small pieces. 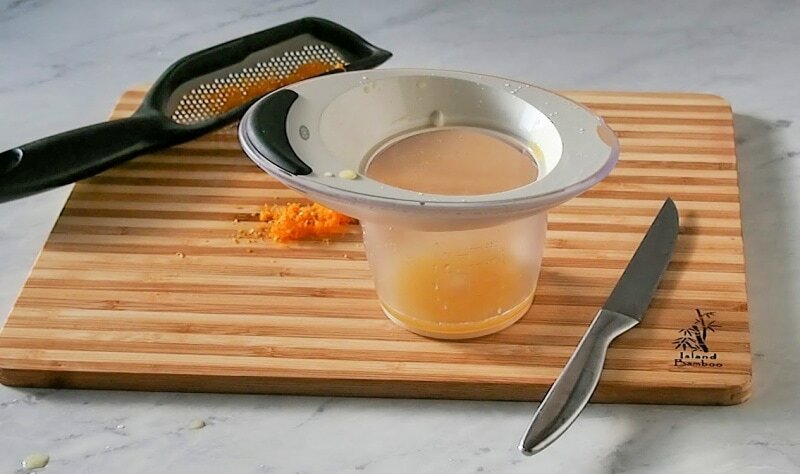 You could also dice them finely if you prefer to just use a knife and a cutting board. Well obviously beets are good for you! They are relatively low in calories, high in fiber and are a great source of nutrients. 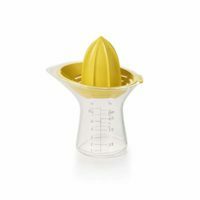 They are also easy to cook and can be used in many different ways. Another great thing about beets is that eat beets they store well and keep for a long time in the refrigerator. The beets I used for this recipe are actually ones I received a few months ago in my CSA share, and they were still delicious. Really the only downside to beets as far as I am concerned is that they stain everything red. Cutting boards, knives and hands will all be a nice bright red after peeling and grating beets! But the red color washes off, so it is a problem that is easily solved. How do you Make the Raw Beet Salad? 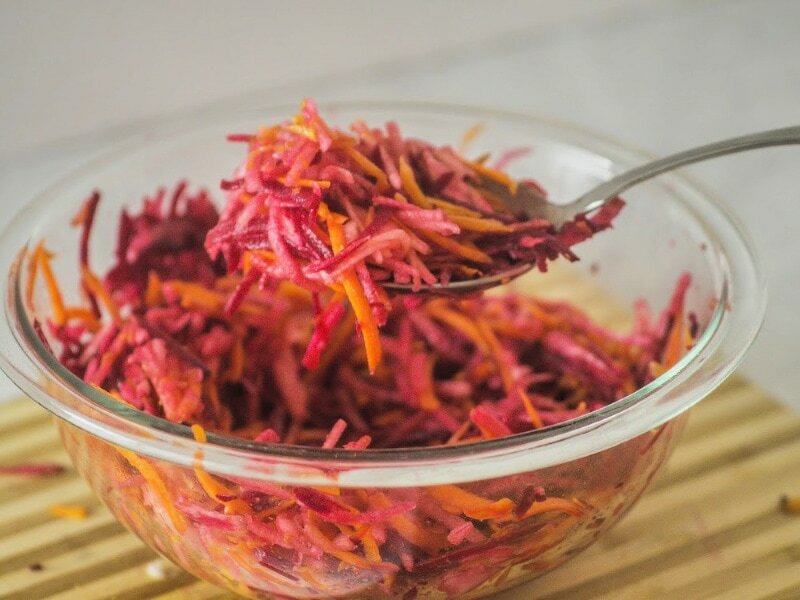 This raw beet salad is kind of like coleslaw, with grated apples, carrots and beets all combined together in a citrus dressing. 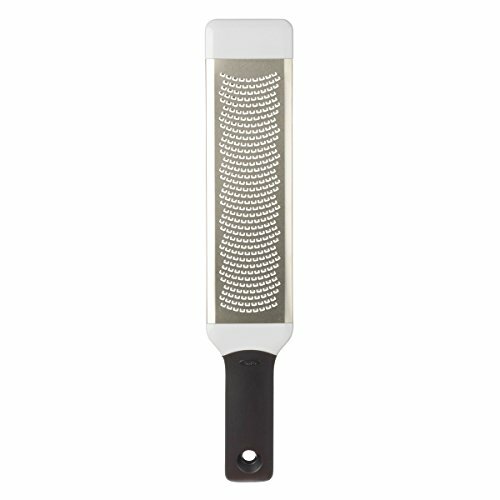 The first step in making the salad is to grate all the vegetables. Because of the tendency of beets to stain everything red it works best to grate them last. I used the same food processor bowl for grating all three of the ingredients, doing the peeled apple first, then the carrots and finally the beets. I was making this beet slaw a few hours before dinner, so layered the ingredients in a quart mason jar to save until meal time. 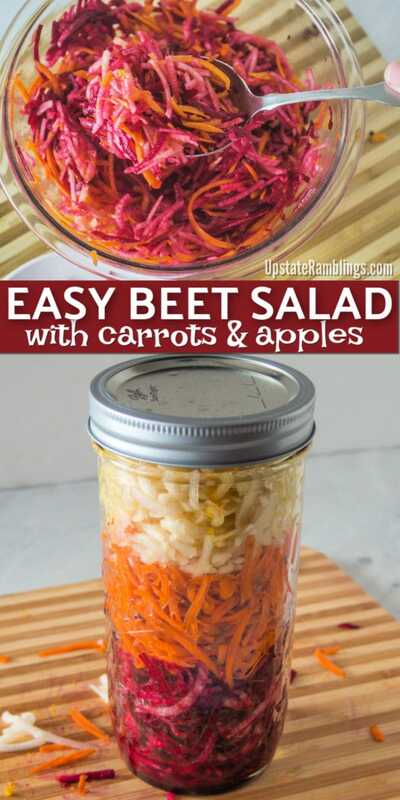 To keep the salad from turning beet red I layered it in the opposite order I grated the ingredients, with beets on the bottom, topped with carrots and finished off with apples. Of course you could just dump everything in a bowl and stir. If you do this the beets will stain the entire salad red, and it will look like a big bowl of grated beets on the table. I know from experience that my kids and husband will not eat a dish that looks like nothing but beets. So saving the salad layered in a mason jar is all about making the final dish look more appetizing to my family. And as an added bonus a mason jar fits more easily into my crowded refrigerator than a salad bowl. 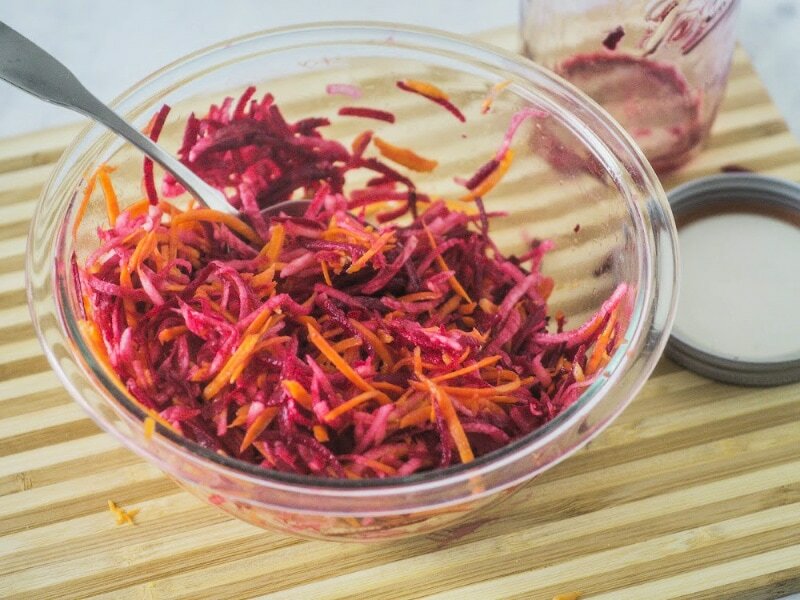 The dressing for the raw beet salad is a sweet citrus dressing. I zested and juiced an orange, and combined that with a little bit of lime juice, oil and vinegar. The dressing is poured into the jar on top of the shredded apples. The orange and lime juice should coat the shredded apple enough to keep it from oxidizing and turning brown. If I was making this more than a few hours ahead of time I’d probably toss the shredded apple with the dressing in a bowl before adding it to the jar, to make sure it was well coated. This raw beet salad keeps well in the refrigerator. I have eaten leftovers of it 3 or 4 days after initially making it and the beets are still crisp and sweet. My family enjoys this salad, even the teenagers who are not big fans of beets. I just don’t point out the fact that 1/3 of the salad is beets and nod in agreement when they comment on how the apples make the salad sweet! A tasty vegan side dish salad that is both sweet to eat and gorgeous to look at. Zest and juice the orange. Combine the orange juice and zest in a bowl, and add the lime juice, oil and vinegar. Stir. Add a pinch of salt if desired. 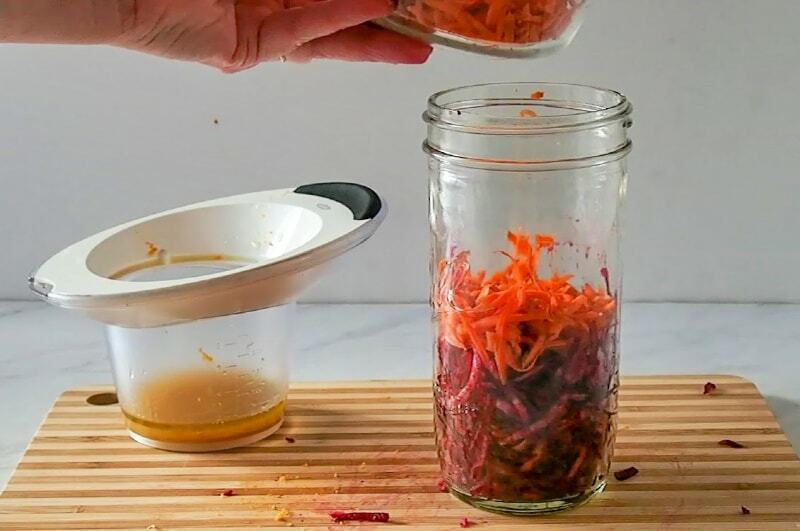 Peel and shred the carrots, apple and beets. 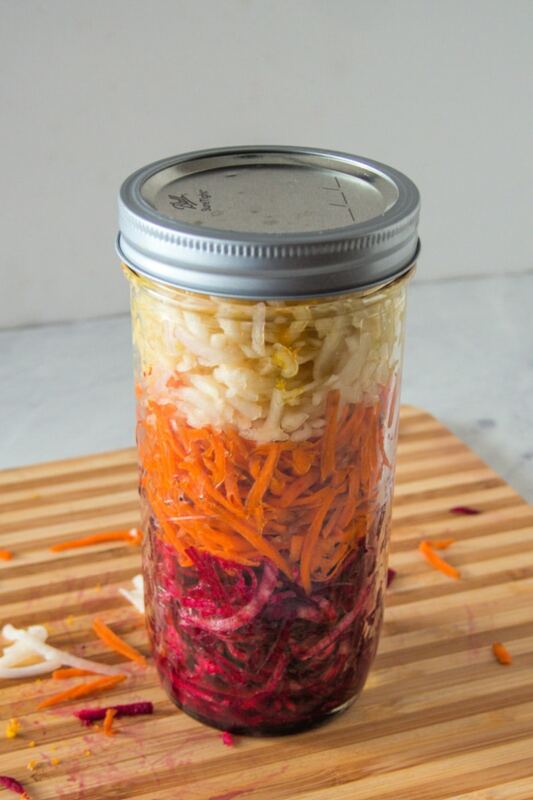 Layer the vegetables in a quart mason jar, shredded beets first, then shredded carrots, then shredded apple. Pour the dressing over top. Refrigerate until ready to serve. 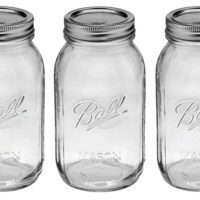 Pour the mason jar into a bowl and stir when ready to serve. You could use a different kind of vinegar in this beet salad recipe, I just happened to have honey vinegar on hand. Sherry vinegar or apple cider vinegar would taste good. I used a combination of red beets and Chioggia beets in this recipe. 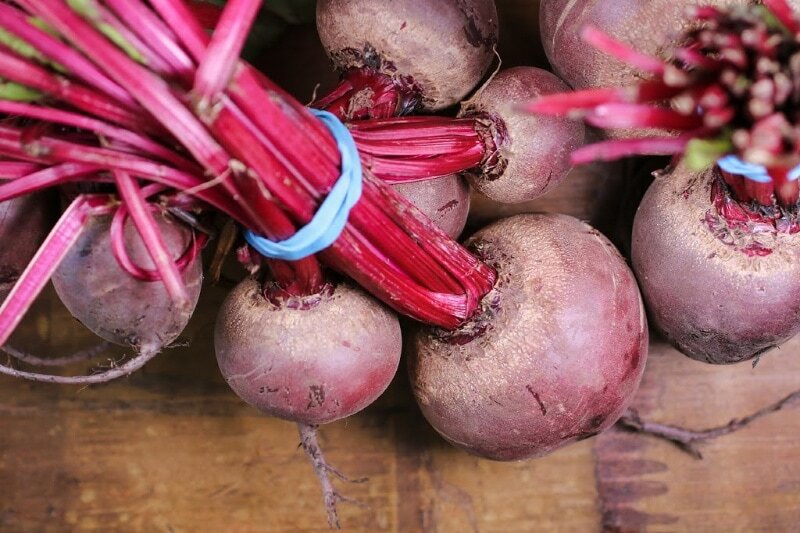 Chioggia beets are red and white striped and even sweeter than red beets.